Published Nov 8, 2017 by Addison-Wesley Professional. Part of the LiveLessons series. 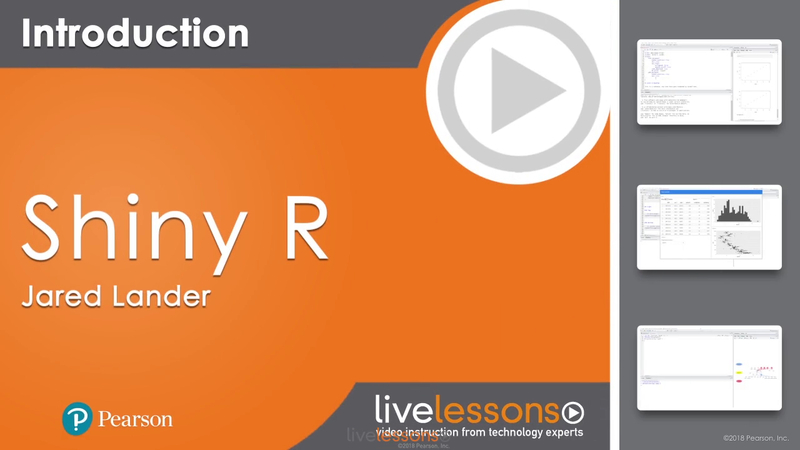 In Shiny R LiveLessons, Jared Lander shows you how to use Shiny to your advantage. Shiny is an open source web framework for R and RStudio that enables you to turn analyses into visual, interactive applications. Shiny applications are easy to write and are built with R. No web development skills are necessary. Jared P. Lander is the Chief Data Scientist of Lander Analytics, a New York-based data science firm that specializes in data science and AI consulting and training. He is the organizer of the New York Open Statistical Programming Meetup and the New York R Conference, and is an adjunct professor at Columbia University. With a master's degree from Columbia University in statistics and a bachelor’s from Muhlenberg College in mathematics, he has experience in both academic research and industry. Very active in the data community, Jared is a frequent speaker at conferences, universities, and meetups around the world such as Strata and the MIT Sloan Sports Analytics Conference. His writings on statistics can be found at jaredlander.com, and his work has been featured in publications such as Forbes and the Wall Street Journal. Markdown is an excellent tool for writing documents. It enables you to focus on content and not be distracted by design. Highly flexible, it can render elegant HTML files, professional PDFs, editable Word documents, web slideshows, and more. You learn the basic structure of Markdown documents and how easy it is to write page after page. Weaving together R code with prose has been a hallmark of scientific writing in R for many years thanks to SWeave and knitr. Now with RMarkdown it is easier than ever before. We go over the necessary steps to integrate R code into Markdown documents for easy blending of results and explanations. Getting started with Shiny can seem daunting at first, having to deal with server-side and UI-side code. This endeavour does not have to be intimidating, however, because Shiny can be integrated into RMarkdown with ease. You learn the basic concepts of Shiny, such as user inputs and rendering outputs, all within a single-file RMarkdown document. The underpinning of Shiny is reactivity. This is how objects are updated based on changes in other objects. We cover the basics of what is needed to know in order to avoid trouble while building Shiny apps. The flexdashboard package enables the creation of stunning web layouts, powered by R, written entirely in RMarkdown. We create a document that looks and feels like a full website and add Shiny components for interactivity.